ConceptDraw MINDMAP is a powerful business and personal productivity software application that provides professional tools for brainstorming, thinking and project planning, generating and organizing the ideas and data, problem solving and other tasks. ConceptDraw MINDMAP offers a variety of input and output solutions that allow create, change and share your mind maps quickly, simply and effectively. ConceptDraw MINDMAP allows to output your mind map to MS PowerPoint, MS Project, MS Word, save as PDF, Web-page (HTML), outline (Text Outline, RTF, OPML) or image. You can also input your data from MS PowerPoint, MS Project, MS Word, MindManager, XMind, OPML and Text Outline sources. 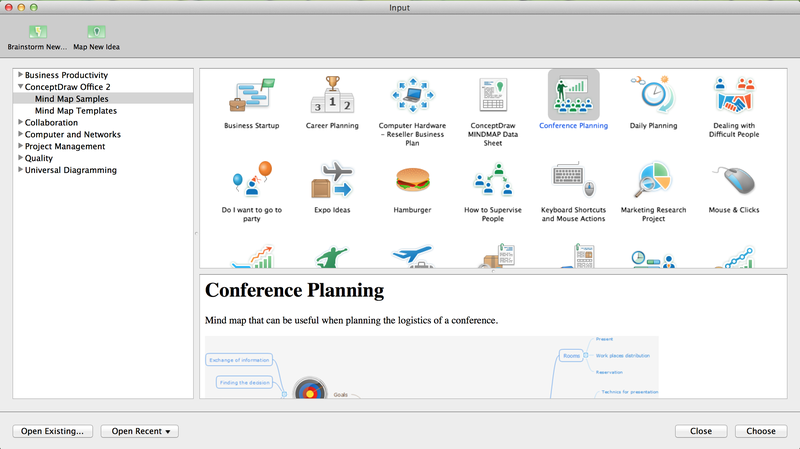 ConceptDraw MINDMAP provides the Input templates that will help you to create the mind map in one moment. ConceptDraw MINDMAP allows you quickly and effectively generate, change, and update your mind maps. It’s very simple and quick to design the mind maps in ConceptDraw MINDMAP You can customize the style of your mind maps, change the form and color of the topics in one click. There is nothing easier than adding images to create the mind map of your own distinct style. ConceptDraw MINDMAP provides many clip art images and Quick Symbols. You can insert the images into the topics or into the empty space on your mind map. 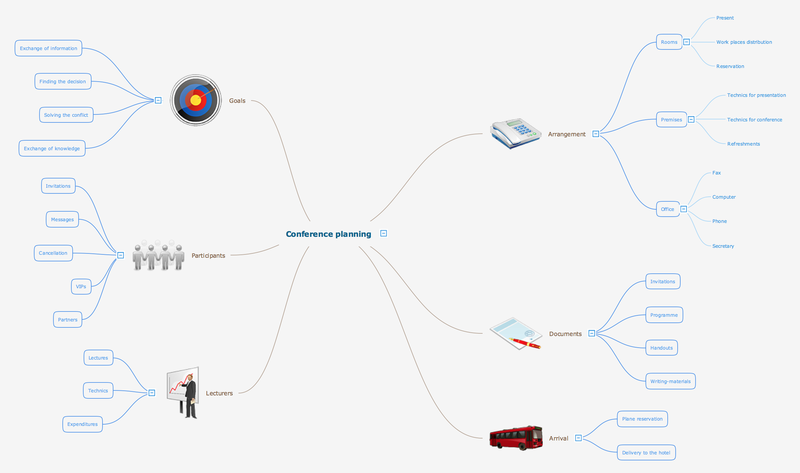 This sample was created with ConceptDraw MINDMAP mind mapping software quick and easy. 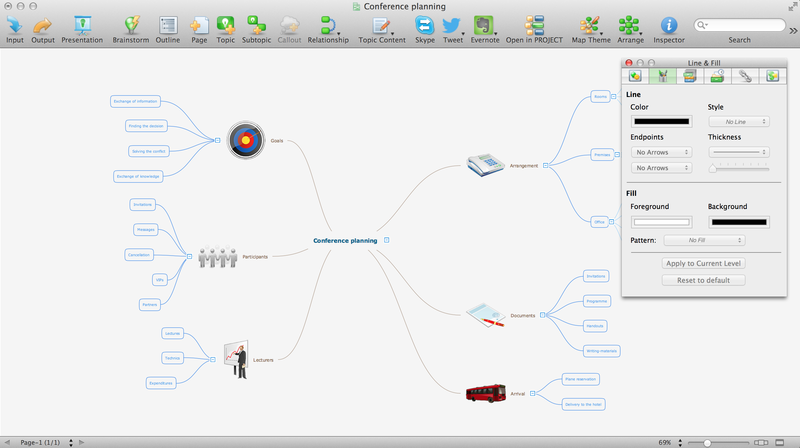 See for yourself the suitability of ConceptDraw MINDMAP by downloading our 21-day trial . The power, economy, and versatility of ConceptDraw MINDMAP takes personnel and team productivity to another level. Discover today what this means to you. Mind Map Food - This sample was created with ConceptDraw MINDMAP v10 mind mapping software. This sample shows the mind map about the such fast food as Hamburger. This sample narrates about the hamburger’s history, ingredients and preparation. You can use this sample at the cooking, in the fast food cafes, on the factories of the fast preparation products. You can use SWOT analysis PowerPoint presentation to represent strengths, weakness, opportunities, and threats involved in your SWOT matrix.